This is a view of the user screen in the system, and we have just placed a door on the west endwall. You can see the building price. Now, all we do is click the door and drag it upwards (to the north) along the same wall. That's it. No changes, no tricks, we just move the door a bit. Now, let's look at this in detail. What some people might consider as accurate is merely that the door is in the wall and we get a price. But when you MOVE a door, this affects the parts that are used to contruct the wall, and this will change the price accordingly. It may not change the price by much, but nevertheless, it DOES change the price. This is an illustration of the system's ability to resolve price based on parts price, cuts, labor, everything you would do to calculate it (and likely even more.) 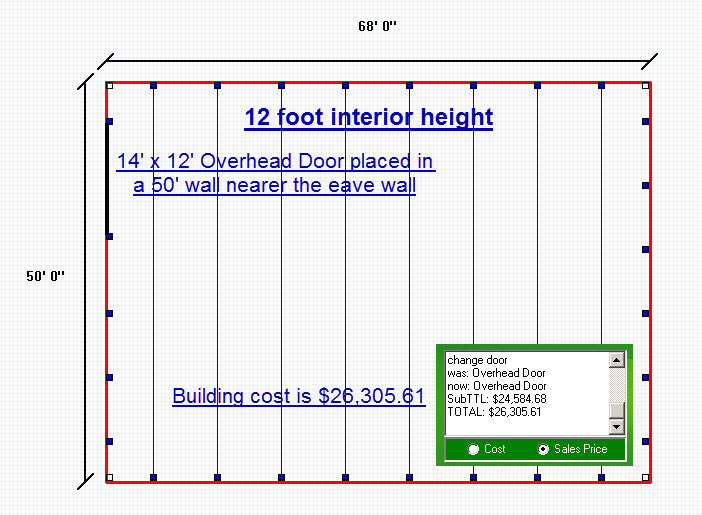 Lots of builders place a door in a wall and assume that the price is fairly fixed; that is, they know the building sq ft is roughly some number, the door removes that much sq ft, then the door has a price, and you mesh these numbers and there's the price. But that's a ROUGH price, a guess, and not an accurate one. 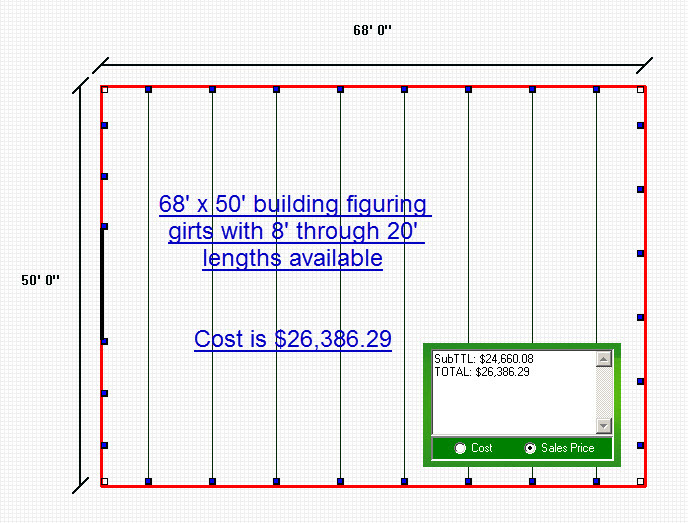 What the PostFrame Manager system offers is the ability to know the price, not guess at it. 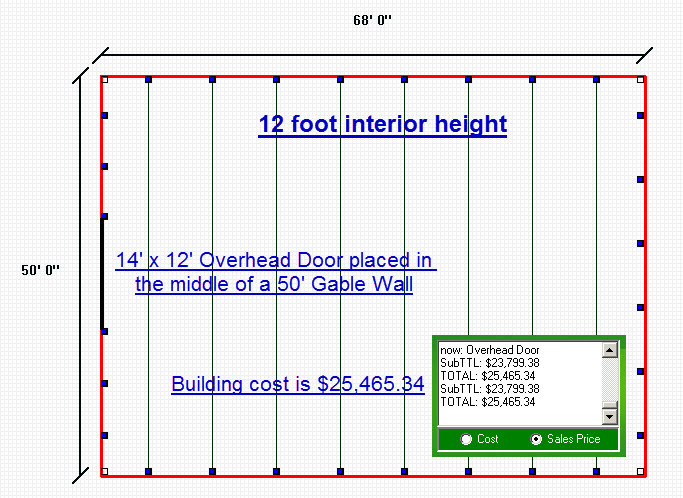 Now, if you're a builder who estimates based on bay size or lineal footage or anything other than counting up the girts used, you would miss this difference in an estimate not using this system. There are many cases where you may not be able to buy a certain length of girt, etc where the system is capable of creating a working estimate and getting it right. Now, while neither of the two examples we showed you are big money, think of making say 6 or 8 minor change to a building. 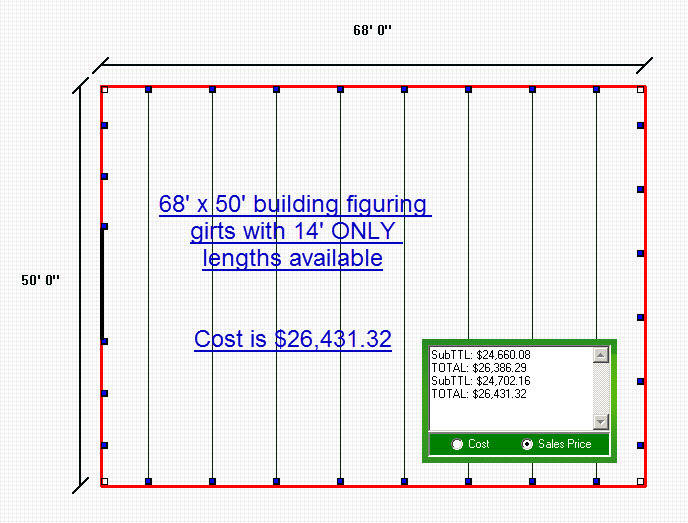 These things add up, and you need your estimating system to correctly account for them. And correct accounting of it starts with accuracy.